None of his usages of “aggression” referred to jihadists, nor to the top funders of jihadists, the Saudi and Qatari royal families, respectively the Sauds and the Thanis. Instead, we arm those people, and they then send some of those arms to jihadists in Syria so as to remove from power Syria’s secular pro-Russian President, Bashar al-Assad. Secretary Carter, like his boss President Obama, want Assad to be replaced by the fighters that the Sauds and Qataris are arming. Carter and Obama call these fighters “moderate Syrians,” though the secular Shiite Assad runs a non-religious government, and all of the fighters against him want a Sunni Islamic state, no secular state at all. The U.S. government says that it supports democracy in Syria, so long as Bashar al-Assad (whom polls show would win any honest election there) isn’t on the ballot. But when America’s ally the Qatari regime, which funds al-Nusra (al-Qaeda in Syria), hired a polling firm in 2012 to survey Syrians, the finding was that 55% of Syrians wanted Assad to remain as President. Then, as I reported on 18 September 2015, “Polls Show Syrians Overwhelmingly Blame U.S. for ISIS,” and those recent polls were from a British firm that has ties to Gallup. So, it’s clear that any sort of democracy in Syria will be ruled by Assad, not by anyone acceptable to the U.S. Establishment, and that blocking him from the ballot would therefore make a mockery of any such ‘democratic’ election. However, democracy in any Islamic state — as the U.S. and its allies claim to be pressing for there — is impossible, just as democracy in any religious state is impossible. (An example of this is America’s ‘ally’ and $3B-per-year recipient of our foreign aid, apartheid ‘democratic’ Israel, which still doesn’t even have a constitution, because religious Jews there insist that any constitution must confirm all biblical laws.) It’s impossible because sovereignty in any religious state rests with the given religion’s ‘god’ as set forth in its Scripture, and not, not even possibly, with “We, the People …” Democracy is therefore impossible without a strict separation between church and state. But none of the “jihadist” paramilitary forces that are fighting against Assad will tolerate such an outcome: they’re all Sunni Islamists. So, there exists an underlying hypocrisy behind the position that SecDef Carter is championing: victory for supposedly some faction of the forces against Assad, and also democracy in Syria. That strength, which Reagan and others helped realize – people like Jim Schlesinger, Brent Scowcroft, Bill Perry, and Harold Brown, who were all mentors of mine – put the United States in position to respond to the day’s crises, and take advantage of Soviet missteps. It gave post-Cold War leaders the power to bring East and West together and deepen the principled international order. And when we were attacked on September 11th, it gave America the power to respond. That strength and the principled international order were part of the inheritance I received when I was sworn in as Secretary of Defense earlier this year. In other words, he suggested that by boosting America’s strategic nuclear forces in response to Russia’s ‘aggression,’ the U.S. will become better prepared to deal with and overcome jihadist suicide-bombers and Saudi-Qatari-financed jihadist groups such as ISIS and Al Qaeda. He intimated that, somehow, there is a sort of dual-use advantage of strategic weapons: their application also against non-state enemies. For example, America’s nuclear deterrent forces were useful in our killing bin Laden? Oh, maybe not that one. However, if those jihadist organizations are financed by Arabic royal families (such as bin Laden’s Al Qaeda was), then those Arabic countries (Saudi Arabia and Qatar especially) are state enemies of the United States; and so, their being hostile toward Russia, as they have been and are, would mean that Russia is, actually, our ally, which then raises the question of why we need to arm against an ally (Russia) in order to be more effective against jihadists (the countries that are owned or controlled by those royals — ‘our’ allies). At the most elemental, human level, our troops are attractive partners, they perform and conduct themselves admirably. I see this, and hear this from foreign leaders, around the world. They make us proud. Despite that widespread appeal, some actors appear intent on eroding these principles and undercutting the international order that helps enforce them. Terror elements like ISIL, of course, stand entirely opposed to our values. But other challenges are more complicated, and given their size and capabilities, potentially more damaging. Russia appears intent to play spoiler by flouting these principles and the international community. Meanwhile, China is a rising power, and growing more ambitious in its objectives and capabilities. Of course, neither Russia nor China can overturn that order, given its resilience and staying power. But both present different challenges for it. The United States, and the men and women of the Defense Department, know that the good that a principled international order has done, and will do. But in the face of Russia’s provocations and China’s rise, we must embrace innovative approaches to protect the United States and strengthen that international order. In Europe, Russia has been violating sovereignty in Ukraine and Georgia and actively trying to intimidate the Baltic states. Meanwhile, in Syria, Russia is throwing gasoline on an already dangerous fire, prolonging a civil war that fuels the very extremism Russia claims to oppose. … Moscow’s nuclear saber-rattling raises questions about Russia’s leaders’ commitment to strategic stability, their respect for norms against the use of nuclear weapons, and whether they respect the profound caution nuclear-age leaders showed with regard to the brandishing of nuclear weapons. We do not seek a cold, let alone a hot war with Russia. We do not seek to make Russia an enemy. The United States will defend our interests, and our allies, the principled international order, and the positive future it affords us all. We’re taking a strong and balanced approach to deter Russia’s aggression, and to help reduce the vulnerability of allies and partners. We are adapting our operational posture and contingency plans as we – on our own and with allies – work to deter Russia’s aggression, and to help reduce the vulnerability of allies and partners. The United States is accordingly making a number of moves in response, many but not all of which I can describe in this forum. We’re modernizing our nuclear arsenal, so America’s nuclear deterrent continues to be effective, safe, and secure, to deter nuclear attacks and reassure our allies. We’re investing in the technologies that are most relevant to Russia’s provocations, such as new unmanned systems, a new long-range bomber, and innovation in technologies like the electromagnetic railgun, lasers, and new systems for electronic warfare, space and cyberspace, including a few surprising ones that I really can’t describe here. We’re updating and advancing our operational plans for deterrence and defense given Russia’s changed behavior. For example in Eastern NATO states [the nations that border Russia], we’re prepositioning tanks, infantry-fighting vehicles, artillery, and the associated equipment needed to participate in exercises and also to respond to crises and provocation. We’re providing enabling capabilities – a distinctively American characteristic – to strengthen NATO’s new Very High Readiness Joint Task Force so it can respond flexibly to contingencies in Europe’s East and South. This innovative capability has already become real: in June, I visited the VJTF – its land component, that is – in Germany. We’re taking part in more and different kinds [of] exercises with our allies to improve training and interoperability. NATO performed admirably in Afghanistan and the exercises today focusing on transitioning to newer threats that also require networked partnership, but very different operational approaches. In fact, TRIDENT JUNCTURE, the largest NATO exercise in 13 years, just ended…yesterday. General Breedlove, who is here, reports a very successful integration of combined U.S. and partner Marines, Navy, ground forces and air forces exercising against a high-end denied environment. Over 4,000 American troops participated in this exercise. We’re helping strengthen NATO’s Cyber Defense Center of Excellence so it can help those nations develop cyber strategies, critical infrastructure protection plans, and cyber defense posture assessments. And we’re providing equipment and training to aid Ukraine’s military as it confronts Russian-supported insurgents in Eastern Ukraine. This summer I spent time with one of our rotational brigade combat teams at Graf in Germany. They represent a new approach: they’ll fall-in on prepositioned equipment, conduct live-fire and simulated maneuver with partner nations, and improve their own readiness and cultural awareness through immersion during this rotation. So we’re doing all this; but, just as Reagan did, we are also taking a balanced approach to Russia. … The United States will continue to hold out the possibility that Russia will assume the role of responsible power in the international order, a direction they seemed headed for much of the post-Cold War era. He refers there to the time before Vladimir Putin replaced Boris Yeltsin in 2000 as Russia’s leader. That was the time when the United States was saying favorable things about Russia because Russia under Yeltsin was taking its guidance from the United States, people such as Lawrence Summers of the World Bank, and such as his Harvard Economics Department, and George Soros, and other champions of clean and honest, non-corrupt government, like we also are now seeing in Ukraine, after Obama’s coup there in February 2014 cleaned up that country, and established peace there. So: the reason why Russia and China are now enemies of America is that they’re not doing what they are being told to do, by the people who are the experts in democracy, and in honest government, and in everything else that’s of benefit to the whole world, except to nations like or allied with Russia or China, which nations, perhaps, can only be amazed at the extent of America’s hypocrisy, or at the extent to which the American government can bamboozle the American people, and even people in certain other countries, to believe anything the U.S. government says. Ashton Carter’s message is Peace Through Strength: the only way to establish peace is by building and deploying more and better weapons, and by insulting ‘enemy’ nations without calling them “enemies.” Our enemies are the nations that are ‘provoking’ ‘peaceful’ nations: provoking the U.S., Saudi Arabia, Qatar, all of our allies. After all, Saudi Arabia, right now, is using our marvelous weapons in Yemen, to establish peace there. By using our weapons, those kindly Saudi rulers are providing jobs for American workers. It’s the only way to keep the world as peaceful as it is: it’s the American way. The Saud family wants these ships so as to be able to kill Russians in Syria and to assist the jihadists whom the Sauds want to grab that country. This is ‘Peace Through Strength.’ So are the American bombs that the Saudi Air Force are dumping on Yemen to kill the evildoers there. Unfortunately, George Orwell’s 1984 somehow missed that one, ‘Peace Through Strength,’ but America’s war-marketers don’t. After all, they’re paid to produce for their clients, and this is very much a ‘free market’ operation the U.S. runs. The American elite’s strategic motivation, ‘Peace Through Strength,’ is so admirable — to the idiots who trust liars such as the American elite. And to U.S. ‘defense’ contractors, it’s nothing short of inspirational (not to mention profitable; after all, ‘Greed Is Good’). These people are real professionals, and no one can top their marketing expertise. That’s the reason why there are all of those proposals in Congress to cut the government to the bone, with that remaining bone being the ‘defense’ establishment. The rest of the government is the portion of it with the ‘waste, fraud and abuse.’ It’s dispensable in ‘the one indispensable nation’ as President Obama calls it (implying that every other nation is dispensable); and he states this repeatedly, sometimes even to the military, so that they’ll know that every nation they’ll attack will be ‘dispensable.’ This Commander-in-Chief has their back. He knows that they’re the muscle that gets the job done for America. They’re the muscle that’s attached to the bone. And, of course, the bone is the equipment: it’s the weapons. That’s firms such as Lockheed Martin, Raytheon, etc. All we really need is the bone. It’s so clean and honest. It’s not ‘waste, fraud and abuse.’ That’s why it’s the foundation of The American Empire. Aristocrats everywhere know how important that is. It produces the bullets and bombs to kill the bad guys, and get the job done, for America, and for the world. It’s so patriotic! It’s so noble; it’s the ultimate Pax Americana. And it’s so realistic: it recognizes that the only way to sustain the peace is by means of constant war, to establish a stable world order, with the one indispensable nation firmly in control of it — everywhere, and not only in Syria. 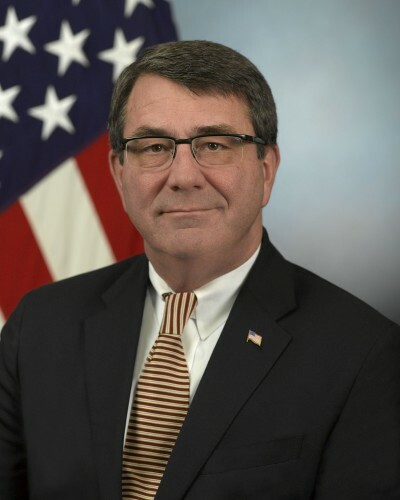 Thank you, Ashton Carter, for your inspiring speech.